A range of photos and memorabilia from Mike Poulton's family collection. 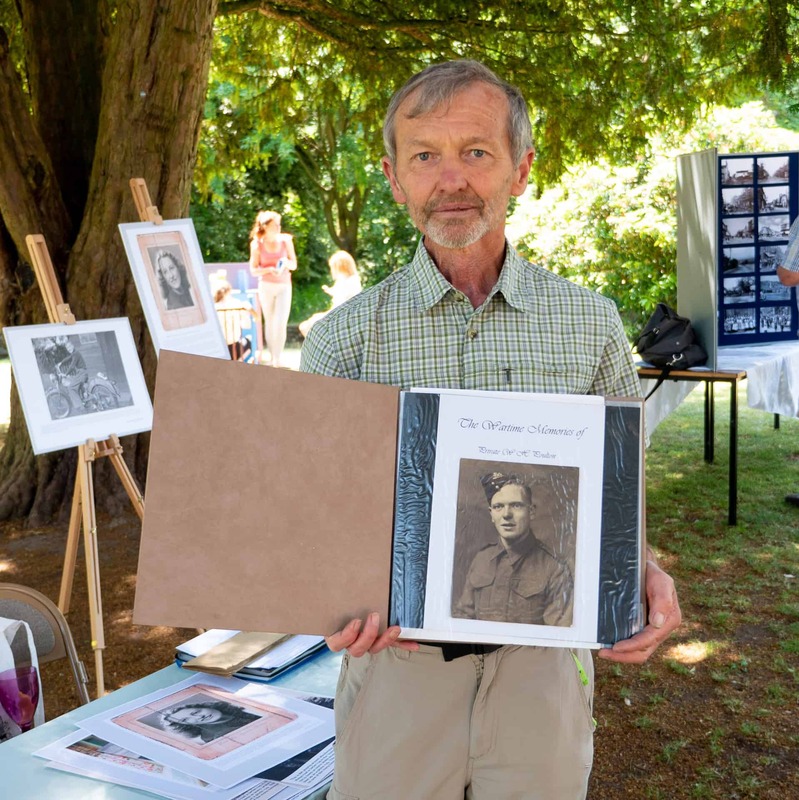 In the autumn and winter of 1999, Mike Poulton made a series of tape recordings of his father, William, known by everyone as Bill, who was then 80 years old, remembering his time in the army during WW11. 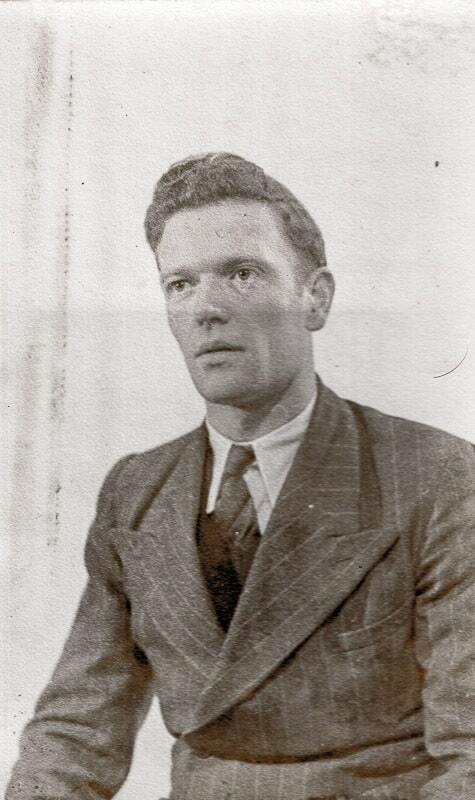 “Dad was conscripted into the Army in 1939 at the age of 20, the year war broke out. Prior to that, he had served an apprenticeship as a Dye Stamper in the R S-Agraph Department at Kendrick and Jeffersons in West Bromwich where he had started work at the age of 14. I knew that he had been a soldier through the duration of the Second World War, but he seldom talked about it. I think he just wanted to put the war behind him and move on with the rest of his life. As the years passed, and mom and dad were getting older, I thought it would be a tragedy if dad died without sharing his wartime experiences. 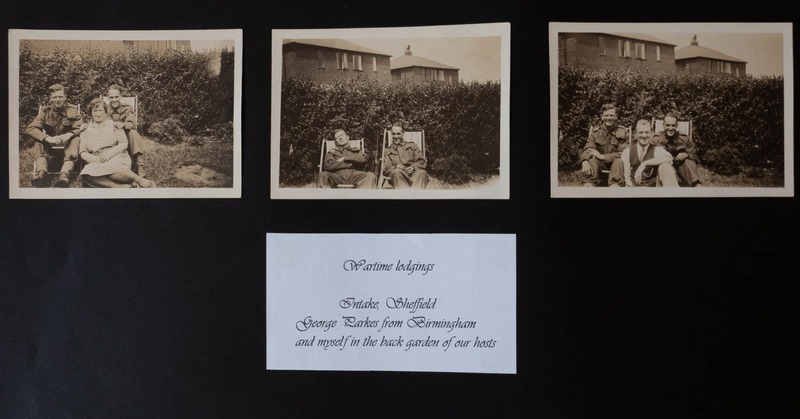 Fortunately, he had kept photographs of some of his army mates taken in places where they had stayed at various times during the war years, and he still had a good recollection of what he had been through. This is one soldier’s memory of his own personal experiences. Every soldier could tell a different story. 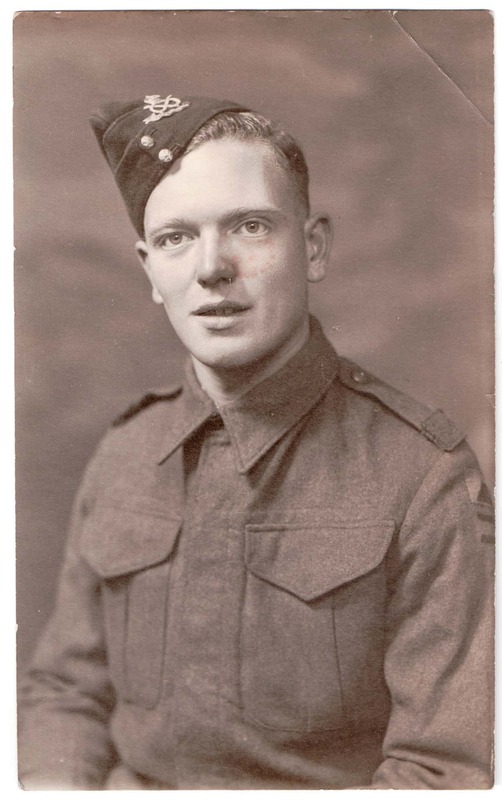 We see war films on television and at the cinema, but this is my dad’s personal journey through the war years. Believe me, there were things that he told me which made me realise how fortunate I was to even be here because he witnessed at close range many of his fellow soldiers and mates either wounded or killed. 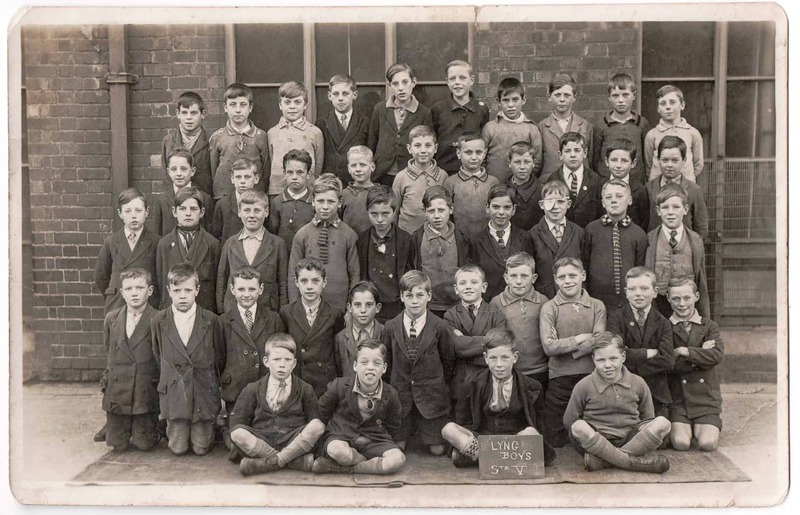 Lyng Boys School, taken about 1930. Bill is second from the right on the second row from the back. 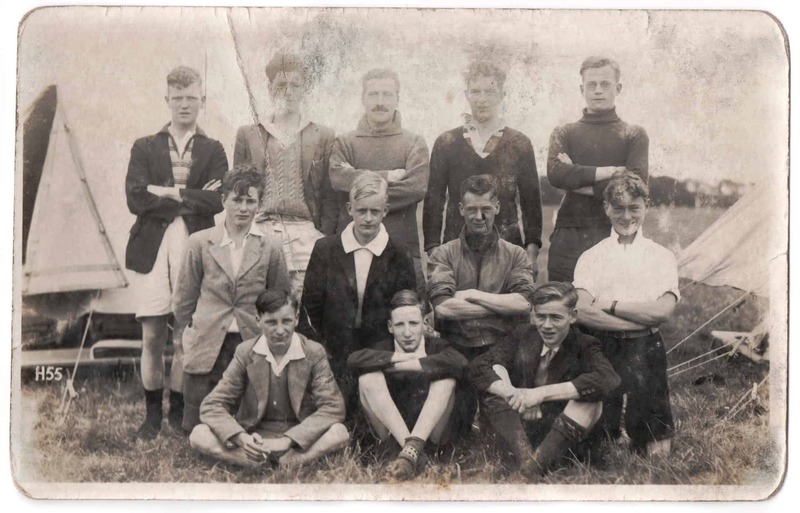 A football team photograph probably dating from about 1934-35. Bill played centre-forward for the works team at K&J. He is back-row on the left in this photograph. After his demob in 1946 he returned to his old job at K & J. A book I have in my possession titled ‘The House of K & J’, published in 1953, lists him as having completed 20 years of service, obviously his army years were included in this. After transcribing the recordings I created this album of my dad's story including a selection of the photographs. Shortly after this time dad became unwell and died a few months before reaching his 81st birthday in April 2000. I would describe my dad as a good-natured person who was liked and respected by all who knew him. He was very tolerant and easy going. He was a good dad. Recalled during the Autumn and Winter of 1999 at the age of 80 years. As we enter the new millennium with all of its hopes and uncertainties it is imperative that we do not forget the men and women that in many cases made the ultimate sacrifice to give us the freedom we have today. These memories are of one mans personal recollections of the war as he lived through it. After a gap of 55 years inaccuracies may have crept in, but that should not detract too much from the overall story. You could say that my dad was one of the 'lucky ones' to come through World War 11 without any visible wounds, but mental scars never heal. He witnessed friends and colleagues wiped out in an instant and more than once must have wondered if the next shell or bullet had his name on it. He saw his brother Sam wounded and the officer sat next to him killed when their carrier was hit by a shell. He saw mates 'incinerated' in trenches shortly after having a laugh and joke with them. In fact the more I listened to the stories he told, the more I realised that war is a lottery and survival was more by luck than anything else. We must also remember that at the time, nobody knew when the war would end, and so a soldiers life was lived on a daily basis with not too much to look forward to. Dad witnessed sights that most of us only see in films and documentaries on TV and took them all in his stride. I think it is only fitting that he should recall as many of the experiences that he can remember as he moves into his eighth decade so that his memories can be handed on to our daughter Heather and passed on down the generations. Britain declared war with Germany on September 3rd 1939. I was conscripted on October 18th 1939 at the age of 20 years and 4 months. Army life began for me on that day as I caught the train from Spon Lane station LMS (long since gone) to Burton-on-Trent. After only a few hours here we were transported by truck to Cannock for 'basic training'. We went into the Territorial Army drill hall. Us 'rookies' were introduced to 'arms drills', 'route marches' etc. The training lasted for three months. In January 1940 we were transported south to Headley in Hampshire for more training. An incident I remember whilst here involved a shop being broken into. The next day we were paraded on the village green and told to take off our puttees (a length of kharki material tied around the bottom of.the trouser legs). Packets of cigarettes fell out from the trouser legs of one of the lads. His name was Jack Sweeney, a lad from Walsall. From here I was moved to Bordon, also in Hampshire. 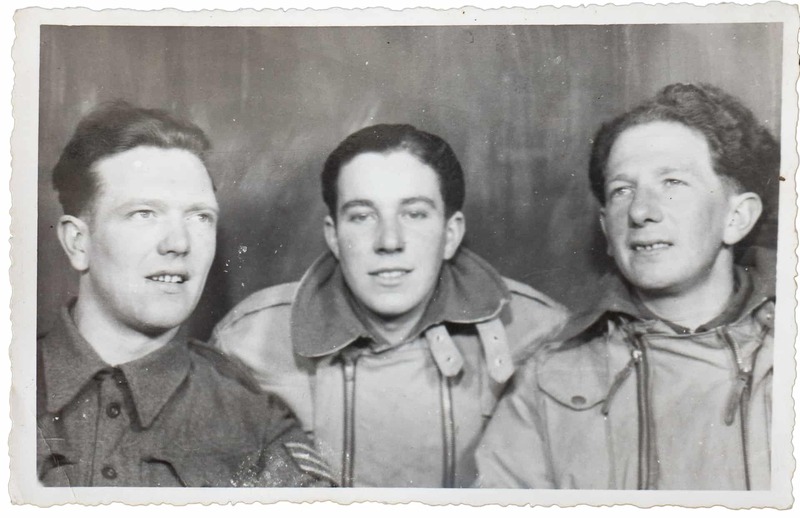 William Poulton - escaped at Dunkirk; Sammy Simmons: captured in Belgium 1940; Jim Smith: ecscaped at Dunkirk; Harvey Woodhouse: Caputred in Belgium 1940. It was here I went along with four of my mates and had a tattoo put on my left arm. 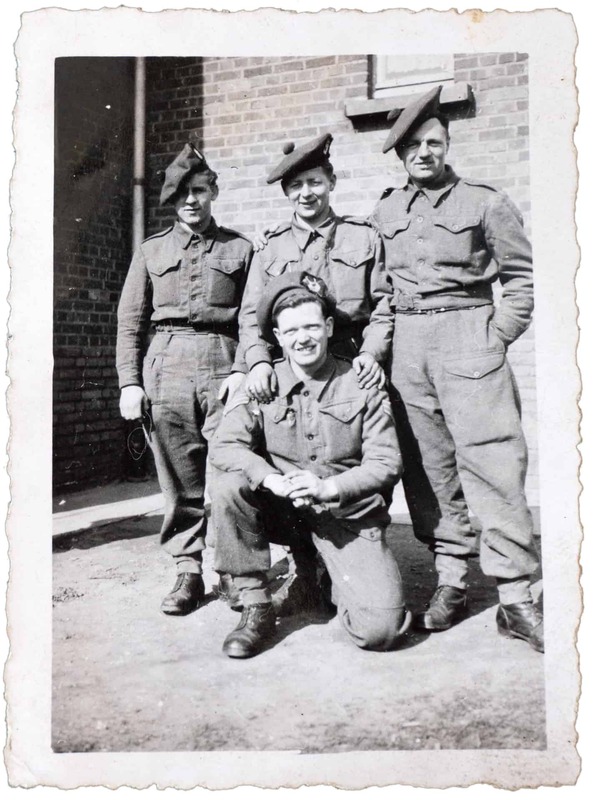 In late January 1940 we were shipped to France and transported to a small town called Bruay-la-Buissiere. French troops were defending the Maginot line at this time but the Germans were coming through Holland and Belgium in a broad· Front and encircling the French troops. We were transported by lorry into Belgium in early May of 1940 to suppress the advancing German army. Our platoon was divided into three groups according to our alphabetical surname, I was put into group 2 with my initial P. There were 10-12 in each group. Along with me I remember George Parkes, Jacky Paler, Jack Plant Harry Pearce, Jimmy Ricketts and Jim Smith. (photograph) We were 'dug­-in' to three 'slit-trenches' but it was obvious we would be overrun by the enemy. We could see them crossing a canal in the distance. Our C.O. ordered group 1 and 2 to retreat and he, with group 3 stayed to cover our retreat. After a time it was obvious from the lack of firing that they had been captured or killed. I found out later that some had survived and had been taken as prisoners of war. The rest of us split up and retreated towards Dunkirk. I walked with Jimmy Ricketts from Northfield and Jim Smith from Wolverhampton. We were down to one bar of chocolate between the three of us and the journey was exhausting. On the way back roads were littered with army equipment, all destroyed to prevent them falling into enemy hands. I fell asleep near Dunkirk and when I awoke I was completely alone and disorientated. I wandered across the sand-dunes and then saw thousands of soldiers massed on the beaches. I could not find anyone that I knew amongst all these men. Every so often enemy planes would go over and spray bullets down on us and men would frantically scrape into the sand as best as they could trying to find cover. Many were killed by these German tactics as there was really nowhere to hide. After some time, I don't know how long, a ship came on to the horizon. It anchored some way out and we could see sailors rowing boats towards us. Officers told us to line up on the beach and the men at the front would wade out into the water to be picked up by the incoming boats. The officer came along the line asking for soldiers from particular regiments. His hand went down between me and the chap behind. "Last one", he said to me, "Push the boat", I was told. By now I had no strength left after days with little food and rest. I started crying from sheer exhaustion. I was pulled into the boat and we headed for the ship. The sailors in the rowing boat gave the order to dump everything overboard. Rifle, pack and everything else went into the sea to make it lighter. We made it safely to the ship and were pulled onboard. I was cold and wet so I stood with my back up against the funnel trying to get warm. Almost immediately, as we started back, an enemy plane came over and three bombs landed around us, but fortunately, missed us completely. All this on May 29th, 1940, my 21st Birthday. We got back to Dover where we were given sandwiches and tea. From here we were put on a train to Ash Vale. I still had not found anyone I knew! Over the loudspeaker I heard them call for anyone in the South Staffs regiment. I responded and was put on a train to Paignton where at last I met up with some soldiers I knew. We were put up in an hotel right on the front overlooking the sea and kitted out as everything had been dumped in our retreat. There was a lot of gratitude and- goodwill shown to us soldiers and it was commonplace for people to come up and push a half-crown into your hand, which at the time was a lot when our pay only amounted to about 'seven Bob' a week (equivalent to about 35p now). You can imagine how handy this extra money came in. 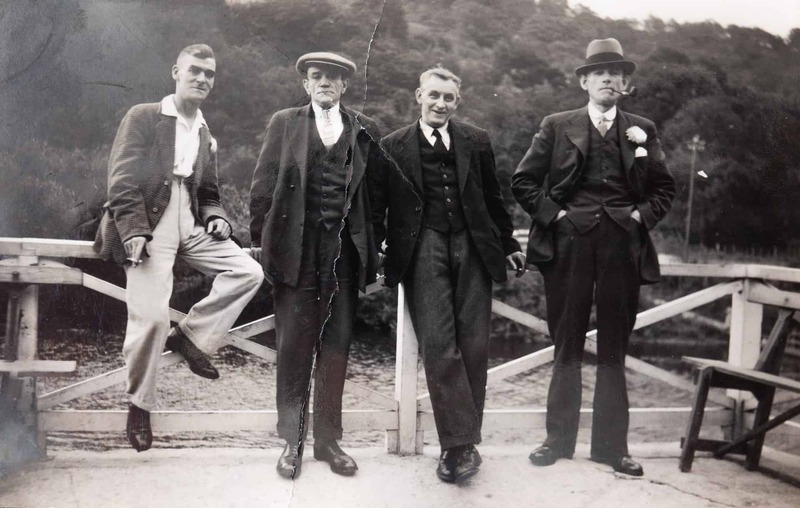 In the autumn of 1941 I went with an advance party to Rostrevor in Northern Ireland. Here we did our manoeuvres and exercises on a wartime footing. It involved plenty of marching and we were often expected to dive into the nearest ditch when the CO said "enemy aircraft''. This we were reluctant to do knowing it was not for real. The CO would give us a grilling but in a real situation you would be in the ditch in a flash. Its just that nobody wanted a soaking in practice. I was shortly to join the mortars and I was promoted to Lance-corporal. There were three of us to each 3inch mortar. Along with me was Vic Tonkinson and Horace Dingley. I was number 1 mortar, Vic number 2 and Horace number 3. This was the procedure. Number 1 - Base Plate line-up. Number 2 - Barrel into Base Plate. Number 3 - Tripod into Barrel and look after ammunition. I had to get the range of the target from the sergeant, _set_ the clock and spirit-levels to set the angle of the barrel. Number 3 would pass bomb to number 2 who would slide it into the barrel. As soon as it hit the pin it would fire. Very occasionally there would be a dud. We would have to carefully tilt the barrel and let the bomb slide gently out. Fortunately this did not happen to often. From Rostrevor we moved to Warren Point. It was mainly training here and we practised walking up rivers, climbing obstacles and I remember a route march over the Mountains of Mourne from Newcastle to near Rostrevor. The aim was to build up our fitness and endurance for what lay ahead. There was, however plenty of free time for football etc. Whilst in N Ireland we were briefed about certain roads in Belfast we should not go down but most of us did not take these things to seriously at the time. Wartime Lodgings. Intake, Sheffield. George Parkes from Birmingham and myself in the back garden of our hosts. After about fifteen months in N Ireland we were shipped from Lame to Stranraer in Scotland. We caught a train from here down into England. It was such a coincidence that the train came to an unscheduled halt in West Bromwich no more than 200 hundred yards from where I lived. I resisted the temptation to pop home but could have made it, as the train was halted for twenty minutes or so. We carried on all the way down to Hythe in Kent. This would be early 1943. 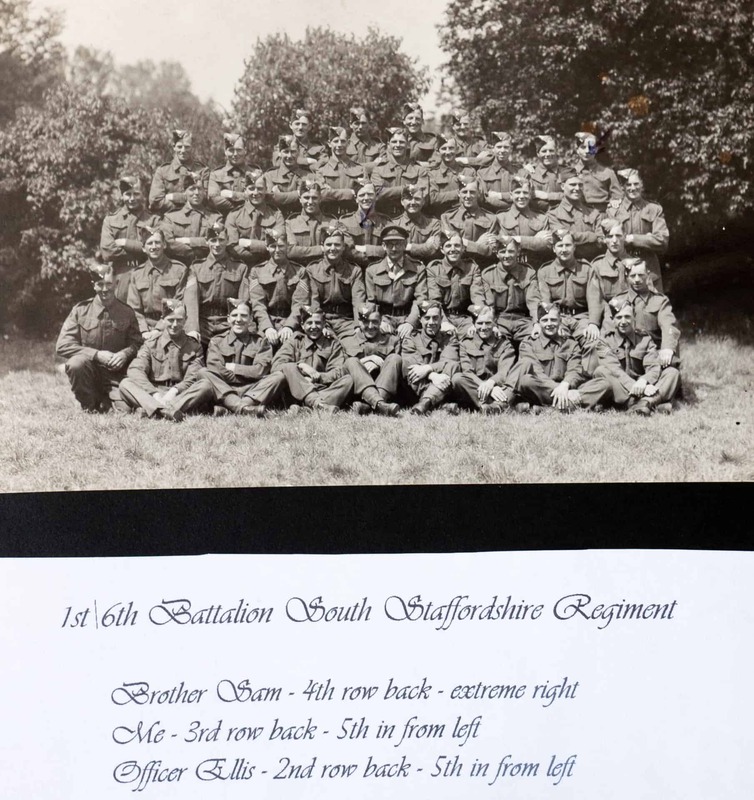 My brother Sam was called up at the age of 18 and was due to go to the Middle-east at the time but as the eldest brother I told the officer in charge that I wanted to 'claim my brother', and in due course he joined us. From Hythe we moved to Dover and we were stationed on top of the cliffs. I remember that there were 199 steps to climb to the top. Our training intensified. Sometimes the exercises involved sleeping rough for over a week. We would be soaked to the skin at times and our uniforms would just dry on our backs. We would 'rough it' in barns and anywhere else we could find to sleep for the night. Whilst here in Dover I was promoted to Corporal and assigned to a 'section'. This consisted of six carriers and three motorbikes. These were split into three sets of two plus a motorbike. There were four men plus a sergeant to each carrier. 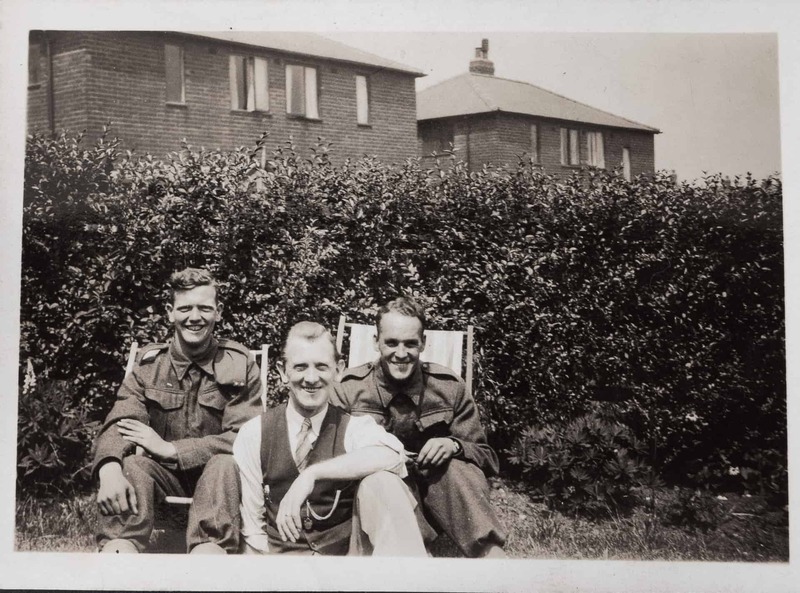 In the one carrier were Vic Tonkinson from Willenhall, Horace Dingley from Hall Green and the Sergeant Gordon Playford. The driver was a Welshman named Jones. In the other carrier were my brother Sam, Jack Stanley, Peers, Sergeant Hemmings and driver Penk. I was the motorcyclist. At this time Dover was being shelled by 'Big Berthas.' These were large German guns situated along the French coast and capable of firing across the 20 miles or so of the Channel. We could hear the shells whistling as they approached. When this happened we would take shelter in caves which were quite safe from anything other than a direct hit. It was the role of the duty officer and Orderley Sergeant to make sure everyone took shelter when the sirens went off and they would be last to go into the cave. Unfortunately for Duty Officer Ellis (see photograph) and the Orderley Sergeant a direct hit by a shell put an end to their lives. There was never a dull moment even when things seemed relatively quiet and one incident I will never forget involved one of our group, I think it was Dingley, who was learning to drive the carrier. He drove the front of the vehicle up a low wall and 'bellied' it on the wall. It was swaying to and fro on this wall hovering over the railway line far below. It was very frightening thinking that at any second we might all plunge down the embankment to our deaths in this carrier. I will always remember the face of Tonkinson from Willenhall, one of those people with a natural dark complexion. On this occasion his face turned white as a ghost. a page from the album. From Paignton we went to Sheffield in Yorkshire and I remember being in digs in an area called Intake with George Parkes, a lad from Birmingham. After a-few weeks we moved to Yarm near Stockton where we were under canvass. Next we moved to Redcar in huts and it was here that everyone had to be de-loused because the place was infested. In November we were at Catterick and I had news that my Dad had passed away. I was given compassionate leave and travelled down by train on the Tuesday. The train was stopped at Walsall because West Bromwich was out of bounds due to it being bombed. I stayed overnight in the police station in Walsall and caught a bus to West Bromwich on Wednesday for the funeral. Richard Street South and near the church in Bromford Lane had been bombed and the rink in Paradise Street was on fire. My brother Sam was in hospital receiving treatment for shrapnel wounds to the legs from an incendiary bomb which had landed in our back garden in Mount Pleasant Street. Because of this he missed dads funeral. I should have returned to barracks the next day but West Bromwich was bombed again so I stayed until Friday. I returned to Catterick and shortly afterwards we moved to Darlington where we stayed in a big old house. Duties here included spud-picking for local farmers at harvest time. Our next move was to Haydon Bridge where we stayed in a schoolhouse, followed by a spell in Nissan Huts. These are corrugated tin-huts with curved roofs. They were heated by a stove in the middle of the room. We followed up the main 'D' Day invasion forces of June 6th a few days later, towards the middle of June 1944. Our Battalion landed on the beach of Arromanches les Baines just to the north of Bayeux in France. The Royal Engineers had put ribbons down to guide us into an un-mined area in which we could beach safely. We were fired on as we arrived but most managed to scramble to cover. We proceeded inland and I remember two mined fields to our left and right. Our infantry marched on through the middle field which was precisely what the Germans anticipated and immediately came under a barrage of enemy fire and mortars. We marched on towards Caen and took over the front line from troops already there. We went to a a big chateau just outside Caen and 'dug in'. We were told to prepare as much ammunition as we could. The following morning at 5-30am everything 'opened up', ships, bombers, mortars, everything! All hell broke loose and the noise was deafening. It was very frightening. This went on and on for what seemed like ages and then the infantry were ordered to move in. Despite all the bombing and shelling of Caen the infantry came under a barrage of fire from German soldiers that were 'dug in' between us and the town. They got through but sustained a heavy loss and later we buried quite a few men by the chateau. Despite casualties this was a major victory in our favour. From here we advanced to a place called Noyers Bocage, a few miles to the south-west of Caen. Germans were on one side of the railway and we were on the other. This place I remember well because it was here that my brother Sam (photograph, third row down, third in from left) was wounded. 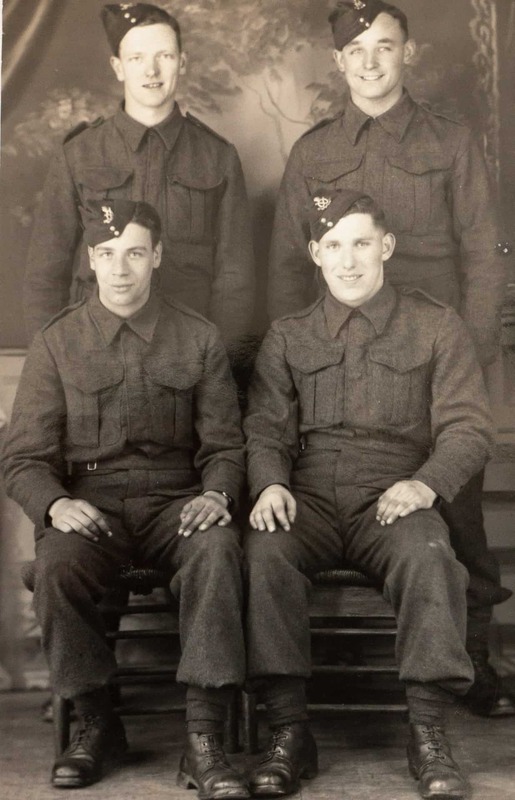 He was a reserve driver and when Officer Norman (photograph, front row 4th in from left) could not get Bullock, (photograph, back row, first left) his regular driver, it was Sam he called on to take him on a 'reci' in the carrier. They proceeded along this road which went round a bend. The Germans had a big 88mm gun aimed at this spot and as they got to the bend, a direct hit by a sticky shell incinerated the officer in his seat. Miraculously, Sam, who was no more than a foot or so away from him, escaped with bums to the leg and shrapnel wounds. I found out some time later and crawled along a ditch to the burned out carrier to look for him, but there was no sign. In the passenger seat was a column of charred remains which had once been the officer. I went all over the place to try to locate my brother. None of the field hospitals knew anything. I wrote home and a week or two later I received a letter from Mom telling me that he had been pulled out of the wreckage and sent home for treatment. He was in Bumtwood hospital near Sutton Coldfield. He had to have skin grafts from his backside on to the burned areas but recovered well enough to complete his National Service. He was sent over to Northern Ireland and worked as a butcher in catering, the occupation he had been in prior to going into the army. Wounds like this do not heal easily and up until quite recently it was not unusual for shrapnel to come to the surface of his skin. The final push - Belgium, Holland and into Germany. As the Germans retreated our pace increased and we advanced quickly through France and Belgium with little resistance. Along the way I trained infantry men to use the mortars. 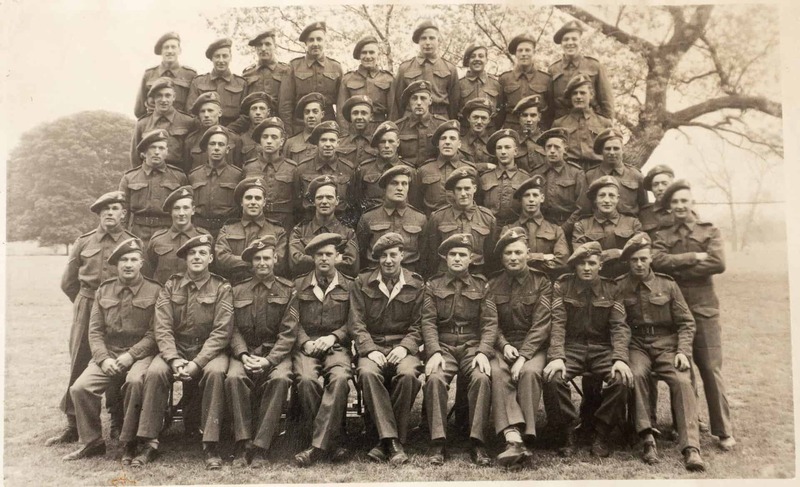 I was promoted to Sergeant and transferred into .the 15th Scottish Gordon Islanders. Fresh supplies were not always readily available due to our rapid advancement and bread was a real luxury. We were given a type of biscuit called 'hardtack' as an alternative to bread. The nearest thing I can liken them to is dog biscuits. We had little stoves for boiling water on which were fuelled by petrol. One chap tried to fill his stove while it was still hot. The petrol ignited and set him alight. We chased him round a field, restrained him and rolled him in the dirt to smother the flames. His resulting bums prevented him from taking any further part in the war. By December we were in Holland. Severe flooding lay ahead of us as a result of the German army laying waste to the dikes as they retreated. All the fields lay under water and only the roads were negotiable. The Germans, as they retreated had mined the roads and one of the carriers just in front of us had hit one of them, killing all of its passengers. 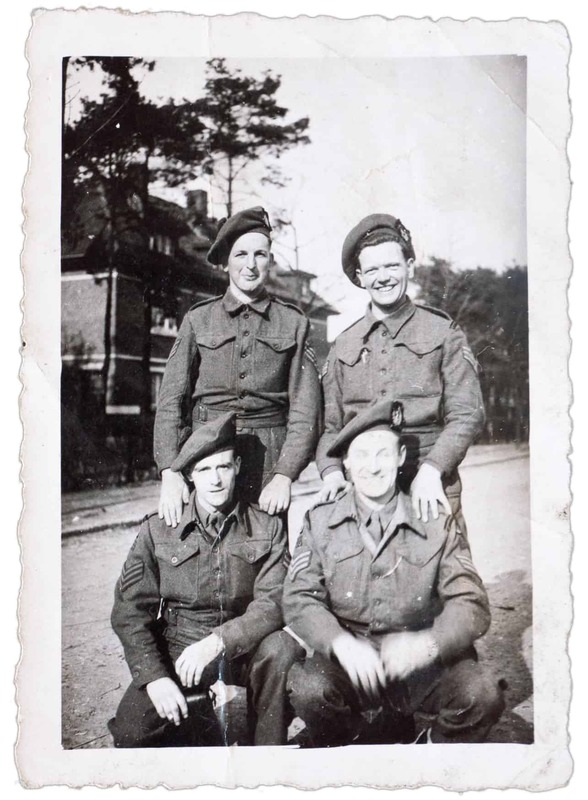 Just before Christmas 1944 we set up camp near Venlo on the banks of the River Maars. We could.see German soldiers camped on the other side of the river and it was strange to hear 'Silent Night', sang in German, drifting across the valley. I was in a forward observation post in a farmhouse and could see the smoke from the fires in their camp and would radio back to give directions to the mortars. As our shells went off you could see them frantically trying to put out the fire to get rid of the smoke which had given their whereabouts away. Shortly after Christmas the German army was massing in the Ardennes. Their intention was to cut our army in two. We had a 'thin red line' stretching up through France into Belgium and Holland. If the German plan worked we would have been cut off and surrounded. Fortunately their attempt failed and we were able to push on into Germany. We dug in for a spell just inside the German border near Cleve. Everything in sight had been flattened by bombs and shells. From here we pushed on to the River Rhine. The Germans knew of our whereabouts and were ready for us. The first flat boat which attempted the crossing came under heavy fire and was sunk. I saw one bloke from this first boat with a bullet hole straight through his pack and another through his respirator. Miraculously he was untouched. Just before our tum to cross dozens of planes went over and the sky was filled with paratroopers. They were landing in trees, hedges, the sky was full of them. Their presence must have put the Germans into retreat because we were able to cross virtually unimpeded. We pressed on and came under mortar fire a short time later. Out of about ten of us six received wounds. The soldier who had the lucky escape crossing the Rhine, this time was not so fortunate. He received shrapnel wounds to his backside. I dragged two men to safety and the rest of us carried on. As we advanced I can still see images of dead cows, blown up like balloons. The stink from them was awful. Thousands of disillusioned German POWs. were coming towards us as we headed deeper into German territory. We went into buildings previously occupied by German soldiers and I remember us sheltering in the cellar of a building in a wood. I was talking to a soldier and a few seconds after I had left him a direct hit from a shell killed him instantly. Such was the lottery of war. The last obstacle was the River Elbe. I remember going with the_ artillery officer into a wood. He called for shell fire. It was dropping right in front of us, a little too close for comfort. We were frantically trying to scrape into the ground for shelter. Fortunately he was able to radio through and get it stopped and we came out unscathed. This was. May 8th, 1945 the day that Germany surrendered. The war in Europe was over. We moved to Lubec on the Baltic Coast just north of Hamburg. A few months ?ere spent here and army life was pretty good. There was plenty of freedom to come and go as we liked. There was army sports and I represented The Gordon Highlanders in the 100 yards sprint and 4 x 400 yards relay races. German civilians had very little and were very demoralised. They would follow us around waiting for cigarette ends to be thrown down after you had finished smoking them. Some of the soldiers were understandably bitter towards the German people after all they had been through and seen during the last six years. I remember a cockney in our lot smoking his fag so far down that it burned his lips and then throwing it into the bushes and saying, "now get that you bastards" From here we were sent to the region of Mecklenburg to stop German civilians caught in the Russian occupied zone from attempting to cross over to the West side. After several weeks here the younger chaps were sent to Singapore but for us older soldiers (I was 26 now) army days were coming to an end. We moved to Hanover where we under canvas. Life was fairly relaxed now after everything that had gone on before. In the early part of 1946 we caught the train to Calais and then we were boarded onto a boat and shipped back to Dover. I had been away since the middle of 1944! I was demobbed at Hereford during February 1946. We were allowed to choose a suit and trilby hat and we were given our train fare home. My army days were over.